What Size of Footing is Right For Your Deck? If you're just joining us, sizing footings for your deck is the topic of discussion. 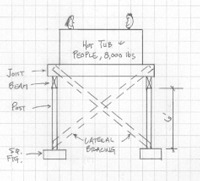 We are building a hot tub deck to support 8,000 lbs of hot water and guests. The footings have to distribute that weight so there is no settling. Let's let Tim Garrison of ConstructionCalc.com carry on the explanation using the Square Footing Calculator software. This is step 5 from Tim's Deck Design Explanation. Read the full pfd version here. Here are the top and side views of the hot tub deck design. Click here to see the pdf version of the Footing Size Report. Dead: 260 (240 Ib from Beam design output under Reactions plus 20 lbs for post self-weight). Soil Bearing Capacity. Use 1,500. See red triangle popup note for typicals. Permit Soil Bearing Capacity Increase for Size and Depth? The UBC code allows the soil bearing capacity to be bumped up for large, deep footings. This toggle allows you to use that or not. It is conservative to select No, particularly if you don't have a geotechnical report and aren't sure how good your soils are. If your footings are small and shallow, either selection is okay because your design won't be affected. Depth to Bottom of Footing. This is the vertical distance from original native round to bottom of footing. We'll use 2 feet. Depth of Soil Over Top of Footing. If there will be soil piled on top of the finished footing, input that depth here. For our example, use O. Square Footing Width. Make a guess as to what you'd like the footing width to be. You may come back and change this later, but for now just make your best guess. We'll start with 1.5 feet. Footing Depth. Make a stab at what thickness you'd like. You may wind up changing it later. We'll start with 8 inches. Post or Bearing Plate Narrowest Dimension. We're using a 4x4 post, so the narrowest dimension will be 3.5 inches. Steel Yield Strength. Rebar comes in two grades: 40 and 60. Grade 40 has a yield strength of 40,000 and grade 60 is 60,000. If in doubt use 40,000. Rebar Cover. This is the distance ITom bottom of footing to lowest rebar. Use 3 inches. Note, 3 inches is the code minimum for concrete placed against ground (an un-formed surface). Rebar Size. Use #4 (112" diameter). #4 is easily obtainable and simple to work with. v) Number of Bars Each Direction. Let's try 3. We may come back to this. The program calculates automatically after each input. As you can see, we guessed quite well; we have a satisfactory design for this hot tub deck. Just for grins, let's try to make a 12 inch square footing work by changing the width to 1 foot. Checking the Results shows the footing is now undersized by 57%, no good. Now let's use the Design Now feature. Click on that button and the program automatically comes up with a satisfactory design, ironically the same one we started with. Final Design. This section simply restates your input if your design is satisfactory. Nothing will show in this section if there is a problem with your design. Miscellaneous Report Detail. This section shows certain engineering data that mayor may not be of interest to you. So there you have it. 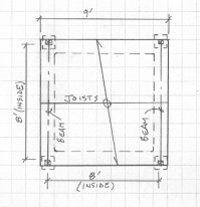 A complete explanation of how to design not only footings, but all the components of a hot tub deck. It's as easy as adding a few numbers and clicking your mouse. And the best part is you KNOW that your deck has been properly engineered and built. If you see a need for your building projects learn more about the entire family of ConstructionCalc software.